From 1993 to 1996, the GERPISA, a French-based international research network that is devoted to the study of the automobile industry and its labour force, carried out an initial programme entitled, "The Emergence of New Industrial Models”, a project in which it examined whether existing industrial models were effectively starting to converge towards the principles of "lean production" – as had been theorised by MIT’s IMVP team. By focusing on what was happening in the automobile industry, the GERPISA Group’s work was able to demonstrate the great diversity, and divergence, of the trajectories that firms have been following in recent times. There is no " one best way" today - there never has been, and there probably never will be. In fact, the first GERPISA research project made it possible to identify and characterise not one, but three industrial models, all of which have been in operation since the 1970s: the Toyotaist model; the Hondian model; and the Sloanian model (epitomised today by Volkswagen, not GM). Companies follow different profit strategies – their attempts to increase their profitability cause them to favour certain policy combinations rather than others (for example volume and diversity, quality, innovation and flexibility, the permanent reduction of costs, volumes, etc.). However, in order to be efficient, all of these strategies have to fit in with the environments in which they are to be applied - especially with respect to the modes of income growth and distribution that are being practiced in the spaces under consideration. Moreover, to form an "productive model", made of an “enterprise-government compromise” between the main parties (that are the shareholders, management, unions, workforce, and suppliers), the strategies need to be implemented coherently. This analytical framework is presented in Boyer, R., Freyssenet, M., [/i]The productive models. The conditions of profitability[/i], Palgrave, London, New York, 2002. From 1997 to 1999, GERPISA realised a second international program, entitled "Automobile Industry between Globalisation and Regionalisation". This project tested the thesis that globalisation is an imperative for corporate profitability; and that it is the inevitable consequence of the deregulation of trade in the aforementioned “new” spaces. This was the logical extension of the first programme, given that "lean production" was as the most suitable model for markets which are variable and diversified, and which are ostensibly moving towards a single global standard. Firms are establishing themselves across the four corners of the planet; new industrialised nations are emerging, as a result of their having opened up to international trade; and more recently, certain auto-makers have been at the heart of some mega-mergers. All of these events have supported the thesis of globalisation, a process which is supposedly galvanised by the fact that companies, in their efforts to benefit from economies of scale, and from improved costs structures, are forever increasing their organisational integration, and are doing this on an ever greater geographical scale. The commercial opening of the new spaces, which some expect to create a homogenisation of demand, is also deemed to contribute to this process. 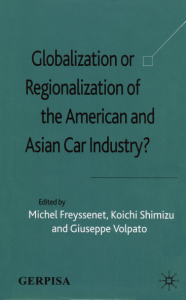 The present publication aims to carry out a systematic description and analysis of the trajectories of internationalisation that are being followed by the various types of firms which are involved in the automobile industry (manufacturers, suppliers and dealers). A companion book (Carillo, J., Lung, Y., Van Tulder, R. (eds), Cars…Carriers of Regionalism) focusses on the trajectories that are being followed in the different spaces (in the industrialised and emerging countries, in the regional groupings) - and it tests the hypothesis of the spaces’ diversity and divergence. These studies identify and characterise the different processes of periodic re-heterogenisation, and the conditions that are necessary if firms, and spaces, are to be successful. Moreover, within this perspective, they will be particularly keen to analyse the steps that are being taken in order that firms’ and spaces’ trajectories can be adjusted and hybridised - actions which in all probability will require considerable strategic and organisational inventiveness. The book highlights the preference for regionalization rather than globalization that has occurred over the past decade. This book looks specifically at the Asian and American car industry. A companion book looks at the European Car Industry.